Ancient Egyptian religion was polytheistic and therefore there were hundreds of ancient Egyptian gods and goddesses. These gods were thought to have power over different aspects of nature and could intervene in different ways. Other than that, ancient Egyptian gods and goddesses were also evoked by the ordinary people through prayers to intervene in their everyday lives. A specific set of rituals and prayers was used to worship these gods in grand temples and monuments that were purposely constructed for them. How many Egyptian Gods are There? It is hard to give an exact number for all the gods in ancient Egypt but it is estimated that their number was well over 2,000. However, not all ancient Egyptian gods had equal importance. Instead, only a few dozen ancient Egyptian gods and goddesses were believed to be most powerful while the rest of them were mostly spirits with certain powers. 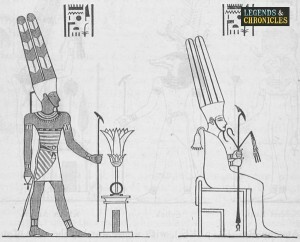 Besides, many gods with similar characteristics were worshipped in different Egyptian provinces with different names. In ancient Egyptian religion, gods usually manifested themselves on the earth through animals. Ancient Egyptian gods were thought to control the universe and the forces of nature. Their relationship with the ordinary people, however, was mainly defined with their supposed power of intervening in everyday life. Thus many prayers and hymns were written which were used by the common people to invoke ancient Egyptian gods and goddesses and seek help from them in their everyday affairs. Further, prayers addressed gods in a more personal way and people enjoyed a close relationship with ancient Egyptian gods and goddesses. The Gods of ancient egypt were numerous and many, with the king of the gods Ammon Ra depicted here. There were dozens of gods in ancient Egypt which were considered more powerful than all other gods and goddesses. One such god was called Atum which was depicted with a man with a double crown. Atum was considered a very powerful god and it was thought that he created all other gods. Another very important god was Aten who was depicted as a sun with sun rays ending in hands. During the era of pharaoh Akhenaten, Aten was made the king of gods. Other famous ancient Egyptian gods and goddesses included Geb, Isis, Nun, Khepri, Hathor, Hapy, Ptah, Osiris, and others. For some of the more popular Egyptian gods we will go into more detail about them right here. Ra was one of the most powerful among the Egyptian gods. He was the sun god and was depicted with a man having a hawk head and a sun disk on his head. It was a belief in ancient Egyptian religion that every night Ra was swallowed by the sky goddess Nut and was reborn every morning. During the night, so the religious belief went, Ra descended into the underworld and roamed there as a man with the head of a ram. Bastet was another very important goddesses in the pantheon of Egyptian gods. She was also called cat goddess and was depicted in the form of a woman having the head of a cat. She was mainly considered protective goddess who saved people from misfortunes. Bastet was among those ancient Egyptian gods and goddesses who had temples made in their honour. Thus a temple was made in honour of Bastet in the city of Bubastis. Every year a festival was held at this temple which attracted thousands of pilgrims. One of the most powerful and magnificent among all ancient Egyptian gods was Amun which was depicted as a man having the head of a ram. He was considered a very important god since the Old Kingdom and rose to supreme importance during the 11th Dynasty when he was considered the king of gods. During the reign of Ahmose I, Amun became fused with the sun god Ra and became Amun-Ra, who was even more powerful. A grand temple was built in honour of Amun at Thebes. The god called Anubis had a special status among the Egyptian gods . He was considered the god of mummification and afterlife and was depicted with a man having a jackal head. It was thought by ancient Egyptians that Anubis watched over the dead and thus his paintings were abundantly made in tombs and burial sites. Due to this reason, priests also often wore the masks of Anubis during the mummification ceremonies. One of the oldest among all ancient Egyptian gods was Horus whose worship began during the pre-dynastic era and continued even after Egypt became a province of Rome. Horus was depicted as man having the head of a hawk and was considered the god of protection. It was also believed by Egyptians that Horus was the son of Isis and Osiris. Osiris was a famous god among ancient the gods and goddesses of Egypt and was thought to be the god of the dead and the ruler of the underworld. Accordingly, he was depicted as a mummified man having a white cone-like headdress with feathers. It was through that Osiris was the husband of Isis and the father of Horus. The pantheon of ancient Egyptian gods would be incomplete without mentioning the god Seth. He was considered the god of chaos and was depicted as a man with the head of an unidentifiable animal. Seth was also the brother of Osiris whom he murdered later on and fought a battle with Horus to become the ruler of the world. Among ancient Egyptian goddesses, some of the most popular were Ma’at which was the goddess of truth, justice, and harmony, Nephthys who was considered the goddess who protected the dead people, Nut who was the goddess of the sky, Seshat who was the goddess of writing and measurements, and various others. Bastet was considered the cat goddess and enjoyed quite an important status in ancient Egypt. She was depicted as a woman having the face of a cat and was considered the goddess of protection from misfortunes. She was a much celebrated goddess and a temple was erected in her honour which was considered one of the most beautiful temples of ancient Egypt. While there were hundreds and even thousands of ancient Egyptian gods and goddesses, not all of them were equally important. Instead, a few dozen Egyptian gods had supreme importance and were thought to be in charge of the universe and the forces of nature. Various temples and monuments were erected to honour these gods, some of which are intact even today.